Albert Goodwin (1845-1932) was a notable English landscape painter specialising in watercolours. His work shows the influences of Turner and the Pre-Raphaelite Brotherhood. Goodwin was born in Maidstone in Kent, the son of a builder and one of 9 children. After leaving school he became an apprentice draper. His exceptional artistic ability was recognised at an early age and he went on to study with the pre-raphaelite artists Arthur Hughes and Ford Madox Brown - the latter predicting that he would become "one of the greatest landscape painters of the age". 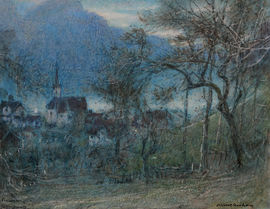 At the age of 15 his first painting was exhibited at the Royal Academy. 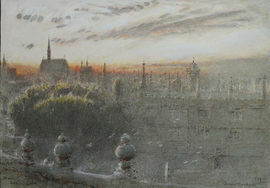 He became an associate member of the Royal Watercolour Society (RWS) in 1876. He was championed by famed art critic John Ruskin who took him on a tour of Europe, where he made many sketches from nature which were later turned into watercolours.